is a reader in early modern history at Royal Holloway, University of London. She lectures on political, social and cultural history in the 16th and 17th century, and is director of the London Centre for Public History. Her latest book is Elizabeth’s Bedfellows: An Intimate History of the Queen’s Court (2013), published in the US as The Queen’s Bed, which won the 2015 American PEN/Jacqueline Bograd Weld Award for Biography. She lives in Cambridge. The climax of the royal coronation ceremony at Westminster Abbey in London is the act of anointing: the monarch is consecrated with holy oil applied to the hands, breast and head, while the Archbishop of Canterbury declares: ‘As Solomon was anointed King by Zadok the priest and Nathan the Prophet, so be thou anointed, blessed and consecrated Queen over the peoples whom the Lord thy God hath given thee to rule and govern.’ For more than 1,000 years, this rite has been re-enacted at every coronation, including Queen Elizabeth II’s in 1953. So sacred is this part of the ceremony that the mystical act was hidden from the cameras, as it was from those gathered in the Abbey. By sanctifying the royal body, the act of anointing has often been believed to confer healing powers. From the time of Edward the Confessor in the 11th century, it was held that kings and queens of England could, by touch alone, cure the skin disease known as scrofula, or the ‘king’s evil’ (a swelling in the lymph nodes of the neck caused by tuberculosis). William of Malmesbury records King Edward restoring a woman with scrofulous sores to a ‘happy state of health’ by dipping his hands in water and stroking her neck. In the 700 years that followed, kings and queens touched hundreds of people afflicted by scrofula in grand ceremonies. From the 14th century, royal healing powers were also considered to be capable of relieving muscular pains, spasms and epilepsy. On Good Friday, special ‘cramp rings’ touched by the monarch were distributed to those afflicted, as were specially minted coins, known as ‘touch pieces’, which were hung around the necks of sufferers and also thought to cure sickness. Through years of dynastic instability, disputed successions and civil war, beleaguered monarchs sought to augment anything that would exalt the mystery of their office. Charles II touched nearly 100,000 people during his reign, and in 1685 his successor James II laid his hands on more than 4,000 in just 10 months. A form of service for curing the sick by the laying on of royal hands was even incorporated in the Book of Common Prayer. William of Orange did not touch for scrofula, though Queen Anne revived the practice. Touching hundreds in Banqueting House, the scene of her grandfather’s execution, she did much to recreate the notion that a monarch had magical powers. These healing practices legitimised the claims that the sovereign was set above all others. After Queen Anne died in 1714, the royal touch came to be associated with Jacobitism and was no longer practiced. Instead, royal sanctity was demonstrated by acts of piety, good works and religious rituals. Central to these is the Maundy Thursday service held each year, which recalls the moment at the Last Supper where Jesus washed the feet of his disciples. While monarchs up to James II actually washed their subjects’ feet, thereafter the practice was commuted to the giving out of Maundy coins, one for each year of the monarch’s reign. Then, as now, a procession of clergy, judges, academics and children carrying bunches of flowers led the monarch into the cathedral or abbey where the ceremony was to take place. Elizabeth II, like her predecessors, is attended by retainers bearing white towels. The yeoman warders carry red and white satin bags filled with the Maundy coins on silver salvers which are now presented to pensioners in recognition of their service to the community and to their church. 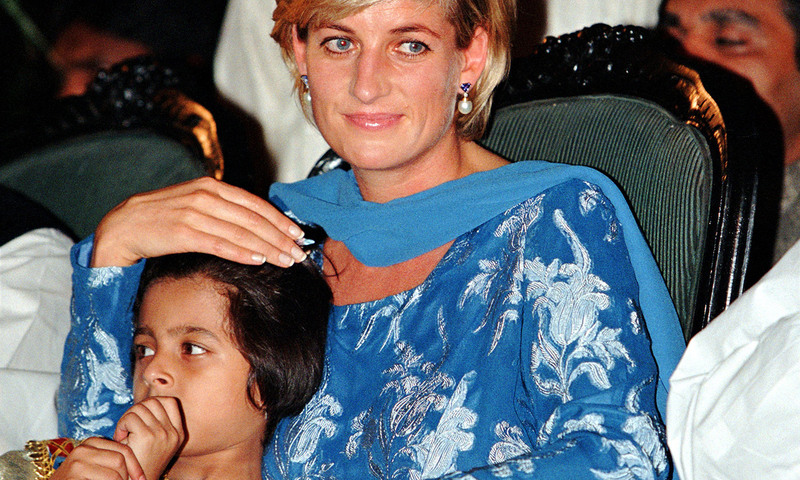 Central to the immense popularity of Diana, Princess of Wales, was the power of her touch, which was strikingly reminiscent of the age-old practice. While she didn’t heal per se, the power of her touch was ubiquitous. Iconic images show her embracing AIDS sufferers and children who had lost limbs to land mines. After her death, her biographer Andrew Morton wrote: ‘Diana’s charisma harked back to the distant days when royal persons were seen as healers, magicians, objects of worship and veneration, even divine beings imbued with supernatural powers.’ Princes William and Harry have followed their mother’s example, and in 2012 the Duchess of Cambridge, Kate Middleton, was lauded for holding a boy dying from leukaemia at a hospice in Malaysia. The boy’s mother described the hug reverently: normally her son was ‘very sleepy and in pain, crying, almost giving up hope, but today, my God, it was as if the leukaemia had gone’. Are the legitimising rituals of the monarchy now impossible to maintain in a rational, post-Enlightenment age? Will the British people – and those across the Commonwealth – continue to accept a 1,000-year-old ceremony that sets one person above all others by divine appointment? Monarchy is almost the last institution in the land to which any mystique attaches – indeed, the mystique is the most powerful guarantor of its survival. To remove the element of magic from the ritual of enthronement might well leave the institution so exposed that it would wither and die. The next coronation will test claims that have not been considered for more than 60 years. In 1953, one in three of the population believed that Elizabeth had been appointed by God. It’s not likely that number will hold when it comes to Charles.